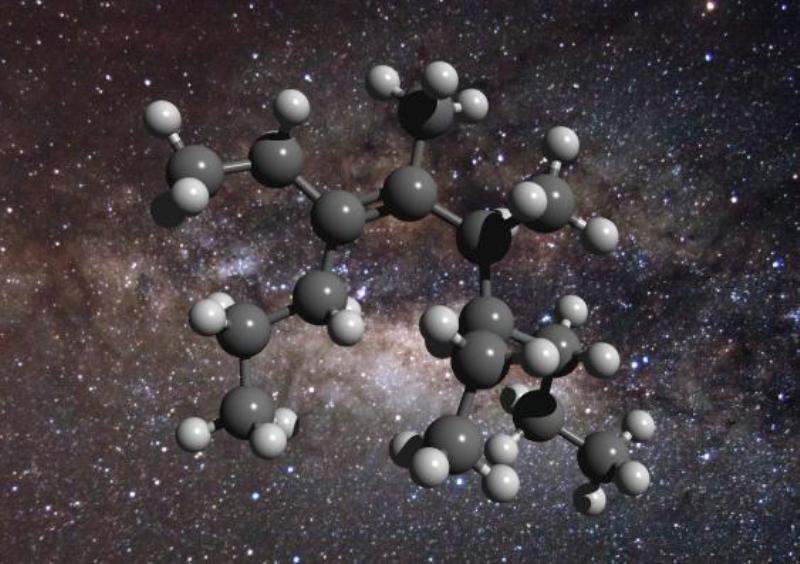 An illustration of the structure of a greasy carbon molecule, set against an image of the galactic centre, where this material has been detected. Credit: D. Young (2011), The Galactic Center/ Flickr – CreativeCommons. A study conducted by astronomers at University of New South Wales (UNSW) in Australia and Ege University in Turkey has revealed that the interstellar space is full of dirty, grease-like molecules. The study has discovered the presence of ten billion trillion trillion tonnes of greasy matter in the Milky Way, equivalent to 40 trillion trillion trillion packs of butter. It also found that there are about 100 greasy carbon atoms for every million hydrogen atoms, accounting for between a quarter and half of the available carbon in space. Scientists are still not sure about the amount of carbon present in different kinds of organic matter. However, only half of the carbon is expected to be found in its pure form, while the rest is chemically bound in two main forms, grease-like (aliphatic) and mothball-like (aromatic). Schmidt further added: “This space grease is not the kind of thing you’d want to spread on a slice of toast! It’s dirty, likely toxic and only forms in the environment of interstellar space (and our laboratory). For the research, the UNSW/Ege team replicated a process that synthesised organic molecules in the outflows of carbon stars by expanding a carbon-containing plasma into a vacuum at low temperatures in a laboratory. The resulting material was collected and evaluated using a number of techniques, including magnetic resonance and spectroscopy (splitting light into its constituent wavelengths). The techniques showed how strongly the material absorbed light with a certain infrared wavelength, a marker for aliphatic carbon.